We've packed our brand new website full of head lice advice, information and fun and games for you and your kids. We've also launched a new parent teacher forum so you can share your concerns with other parents, and provide each other with advice about how to defend against head lice. We've also provided you with tips and head lice information we've picked up over the years that we're sure will be helpful to you, and if you do have any other questions, we're only an email away! 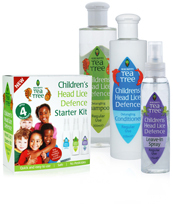 Escenti Children's Head Lice Defence Hair Care Range is specially formulated with pure tea tree oil to help defend against head lice and nourish the hair. It contains a special detangling agent to help make hair easier to comb and tangle free. Over the past few years, my children have been plagued by headlice. All that changed when I bought a bottle of Escenti Tea Tree head lice defence shampoo. Since then we have been louse free. I cannot praise the product enough!